Cooks and Corks, a celebration of local cuisine, wine and the arts is set to return for its 4th year at the Four Seasons Resort Scottsdale at Troon North on Friday, November 11, 2016. 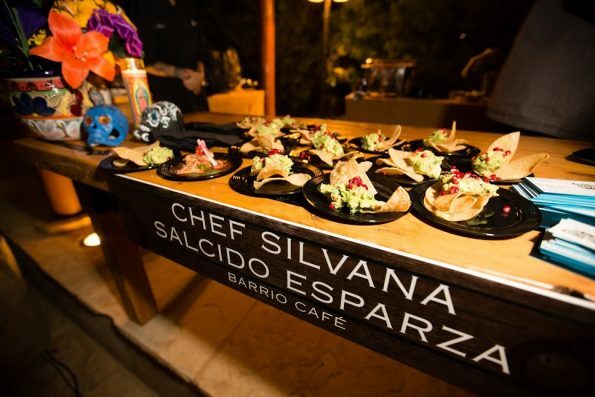 Hosted by The Scottsdale League for the Arts (SLA) and presented by Earnhardt Cadillac, the event will feature Arizona’s top local chefs and a one -of- a- kind collection of winemakers. Along with fine spirits and craft beers sponsored by Hensley Beverage Co, guests will indulge in a true culinary celebration under the stars. To kick things off, Sassy and The Sneak Attack will have guests grooving with electrifying vocals plus high energy disco, rock and funk music. Then, get crafty with activities by Pinspiration or strike a pose with Photobooth 9. Guest can also check out the silent auction packed with amazing gifts from local restaurants and retailers. Cooks and Corks will take place on Veteran’s Day this year and will include a 50/50 raffle benefiting a local veteran arts organization. Cooks and Corks is the official kick off of our event season at the League. Every penny raised from this and all of our events goes to support art programs in our community, and this year, I’m honored to have the chance to support our local Veterans.” said Dan Bowman, president, Scottsdale League for the Arts. General Admission is $125 and includes unlimited food and drink samples throughout the event. Presale tickets for general admission are available online at www.cooksandcorks.org. Special thanks to our sponsors: Earnhardt Cadillac, The Four Seasons, Hensley Beverage Co, Drewett Works, Jalapeno Inferno, DryBar, Glamour & Woods, Fiori Floral, Photobooth9 and Pinspiration for helping to make this event possible. Cooks and Corks will be located at the Four Seasons Resort Scottsdale at Troon North, 10600 E Crescent Moon Drive, Scottsdale, AZ 85262. Patrons are encouraged to come dressed in cocktail attire and bear in mind this is an outdoor event, some guests may wish to bring a light jacket. Complimentary valet parking with be available at check-in in front of the hotel lobby. For more information, visit: www.cooksandcorks.org. The Scottsdale League for the Arts is a 501(c)(3), a non-profit volunteer organization of accomplished men and women who support artists, arts programs and arts education through fundraising and special events. In order to offer continuous value and assistance to the arts, the League awards all net funds raised to a variety of arts-focused organizations through a grants program. For more information, visit: www.leagueforthearts.org. The Alliance is a 501(c)(3) non-profit art organization comprised of thousands of artists from more than 20 Arizona-based art groups. Founded by local artists in 2000, the Arizona Art Alliance is committed to the promotion and appreciation of fine art and the enrichment that art brings to the community. Through the dedication of its leadership, a strong spirit of volunteerism among the membership, strategic partnerships with government, business and community organizations and valued financial supporters and sponsors, the Arizona Art Alliance continues to achieve its mission to promote visual art education and appreciation. For more information, visit: www.azartalliance.com.